The first thing we need to do is some basic hook-ups to open a modal to edit our rows. To do this we’ll add a little button as the first column of our grid. For the modal we’ll use UI Bootstrap’s $modal service, and Font Awesome for icons. These are our column defs, we’ll use edit-button.html as our custom button template. There’s our editRow function, which we expose by binding it to our controller. If we declare our controller like ng-controller="MainCtrl as vm" then we’ll have the vm property available on grid.appScope to use in our button template. RowEditCtrl will be the controller for the modal which we’ll define later. The editRow function will take the grid and row as arguments and we’ll inject them into RowEditCtrl as locals with resolve. You can read about all this in the UI Bootstrap modal docs. What’s that sf-schema stuff? I’m glad you asked! Angular Schema Form is a directive that takes a few options and generates a form with inputs bound to the data that you specify. First there’s the schema. This is a JSON Schema standard object that defines the data in your entity: their type (string, number, boolean, array, etc), title, description, and so on. Notice the type: 'object' and properties that we use to set up the root of our schema. Don’t forget this or your form will not work with no errors and you’ll be scratching your head like I did. All our elements are pretty straight-forward. The only exception is the city, which is a slightly more complex binding. Angular Schema Form uses objectpath library to determine bindings so there’s some options if you have nested properties you want to access. Remember those sf- attributes on our form in the modal template? Well the first one, sf-schema, gets bound to the schema we just created. sf-model is bound to the object we want to edit, in this case our row, but if we bind directly to the row we will be updating it live, which can be nice sometimes but it would be good to have a “cancel” feature. Let’s do that. Alright, our modal controller is going to get $modalInstance, which the $modal service injects for us. We can use that to interact with the modal (closing it and so on). 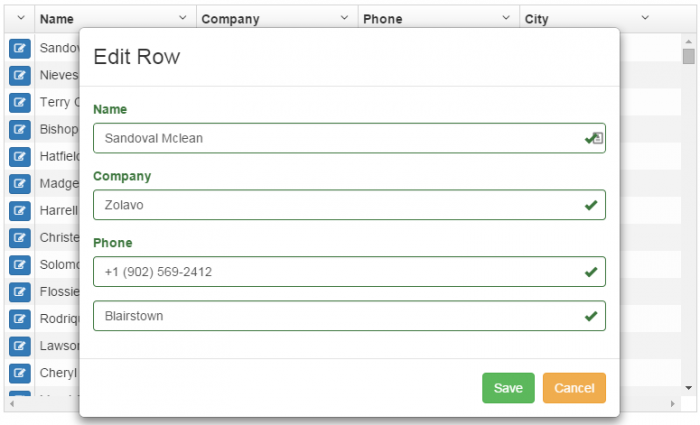 We’ll provide the PersonSchema, copy our row entity so we’re not directly editing the row, and then the next property is form. What’s that? We’ve given our form a schema, which tells it what properties to expect, but how about what order they come in, or which ones we want to edit in this form? If we didn’t really care we could do vm.form = ['*'], and then in our &lt;form&gt; do sf-form="vm.form". The ['*'] tells Angular Schema Form to just use all the properties from the schema, in whatever order the come out in. The problem with this is our address.city property won’t show up correctly. We have to explicitly tell the form what to expect, and since we have to tell it that we have to tell it all of them. There’s lots of options for defining your form with Angular Schema Form: you can specify input types (text, radio, select, button groups), do hierarchical lists, tabs, conditional visibility, etc. There’s good examples on the project site. The only thing left is the save function which copies over our updated row entity and closes the modal. Tada! You are the proud owner of a modal editor for UI-Grid which you can update whenever you want with only a couple lines. Almost painless, right? Here’s a plunker showing it all working together. Note: plnkr.co has been a little wonky about not loading fully sometimes; you may have to refresh it. I hope you enjoyed this guide, and I’d like to help you out some more! Next time we’ll walk through creating a UI-Grid plugin that will let us reuse this modal row editor code and create them wherever we want in just seconds. We’ll talk about Angular development best practices and use a plugin skeleton for creating tests, automatically generating documentation, and all that fun stuff. Sign up here and I'll send you more tips, tricks, and shortcuts like this. I hate spam MORE than you and promise to only send things that will make your life better.